Ten days ago, the Boston Celtics parted ways with Courtney Lee, and now the team has reached an agreement with the Golden State Warriors and Miami Heat to trade two more guards, sending spot starter Jordan Crawford (13.7 PPG and 5.7 APG) and Red Claws standout MarShon Brooks to the Dubs. There must be some truth to the recent rumblings about Rajon Rondo's return, rendering the potent services of Crawford obsolete. Golden State will send guard Toney Douglas to Miami, and Miami will send center Joel Anthony and a future first-round pick and second-round pick to Boston. With Lee, Crawford, and Brooks now gone, Boston's once-crowded backcourt rotation is down to Rondo, Avery Bradley, Jerryd Bayless, Phil Pressey, and Keith Bogans (sort of). The Heat, who had reportedly expressed interest in Jordan Crawford earlier in the season, were in the market for a sparkplug guard. Toney Douglas is just that. In Crawford, the Warriors get someone who can anchor the second unit much like Jarrett Jack did last season. MarShon Brooks should thrive in a faster-paced system. The Celtics receive, in order of importance, assets, salary cap flexibility, and a big body with a contract through 2014-2015. 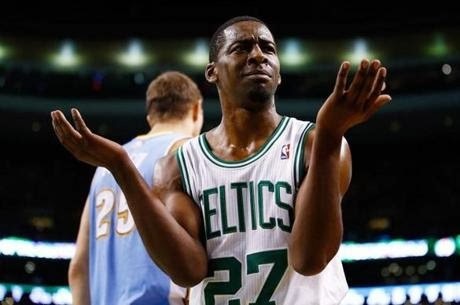 Also, with how aggressive Danny Ainge has been recently, should we start saying goodbye to Brandon Bass? Update: The first-round pick from Miami is actually Philedelphia's pick. If they miss the playoffs in 2013-2014 and 2014-2015, it becomes two second-round picks.